will probably just take a power feed off the accessory socket but would appreciate any advice. Went for the black carbon fiber. make sure to document and snap pictures if you can to share. I'm sure lots of people would appreciate it. 2. move the 2 pop in lugs by pushing in the center. 3. pop out the small window behind the cup holder and remove 10mm bolt. 4. pop out center piece (use finger nails)..
..... and remove 10mm bolt. center console should now lift out. 8. Replace center console and shift knob. 9. remove glove box - open, squeeze sides, pivot right down to floor and unclip. 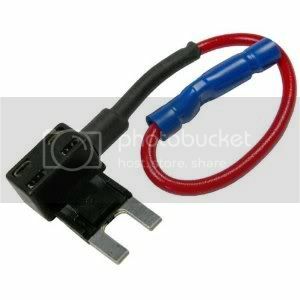 Use wire tap connectors to splice into accessory socket wires without cutting them. 11. Test and replace glovebox. With this installation lights are always on from accessory key position. Would love to have them come on with headlights only but would need a wiring diagram - don't want to set off any airbags explosive seatbelt pretensioners etc. Left a bit of spare wire to tap into for blue LED underdash lighting in future. Last edited by jid; 05-18-2014 at 12:05 AM. Great detail in the write-up. Looks good to boot. Nice improvement at a very reasonable price. Thanks for all the feedback. The accessory really looks cool to install. To have the lights switch on when headlights or park lights are on, you can source the electricity from the fuse box rather than from the accessory socket. If you tap your wire to the rear left light fuse (found in the fuse box next to the glove box), you lights will come on when you switch on your parking lights. Last edited by KidInMe; 07-30-2014 at 11:32 AM. Does it light the different positions when the shifter is in 'em or is the entire strip lighted? I am going to experiment with dimming them down a bit though.